Commonwealth games 2018 have ended in the weekend. 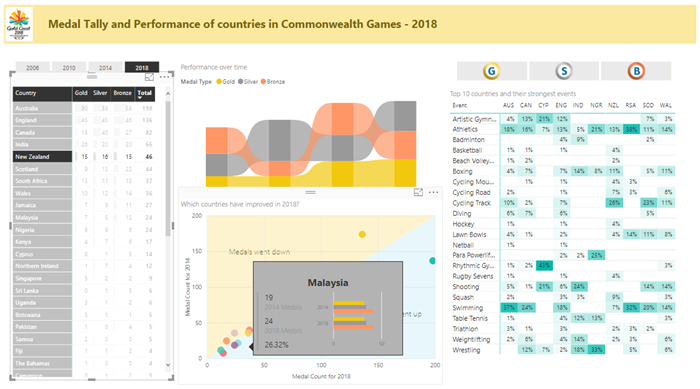 Let’s take a look at the games data thru Power BI to understand how various countries performed. 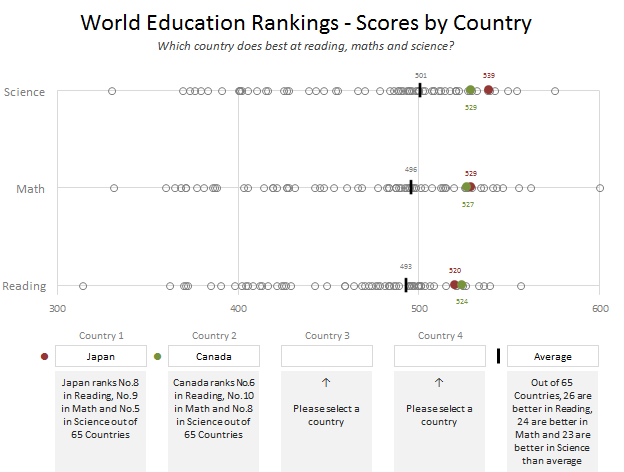 Here is my viz online or you can see a snapshot above. Looks good, isn’t it? Well, read on to know how it is put together. Recently, I saw this chart on Economist website. 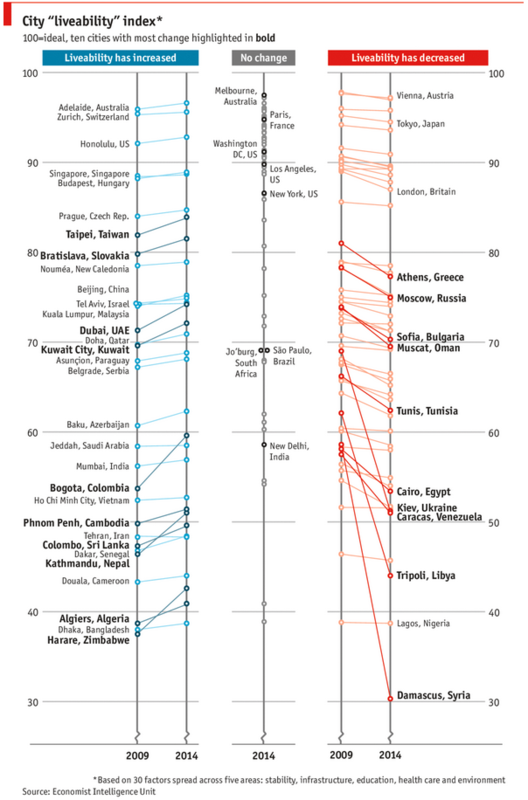 It is trying to depict how various cities rank on livability index and how they compare to previous ranking (2014 vs 2009). As you can see, this chart is not the best way to visualize “Best places to live”. Labels are all over the place, thus making data interpretation hard. Some points have no labels (or ambiguous labels) leading to further confusion. After examining the chart long & hard, I got thinking. Its no fun criticizing someones work. 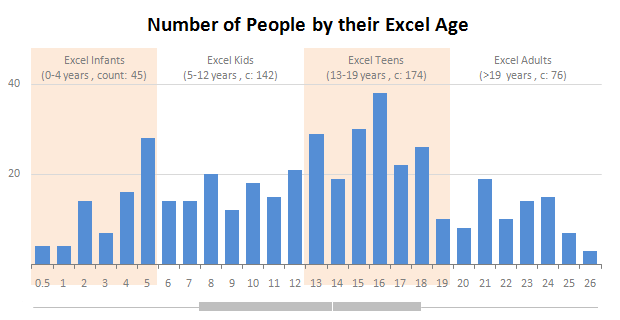 Creating a better chart from this data, now thats awesome. 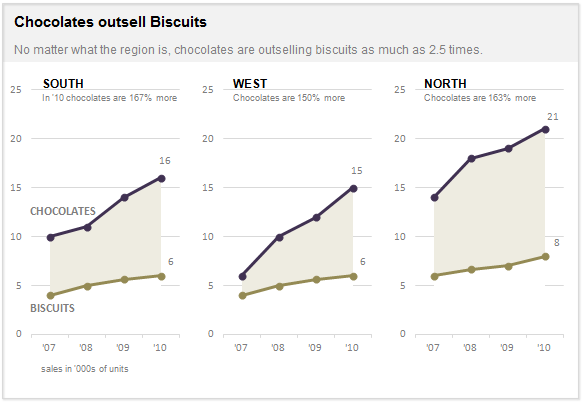 If I need some charting inspiration, I always visit New York Times. Their interactive visualizations are some of the best you can find anywhere. Clear, beautifully crafted and powerful. 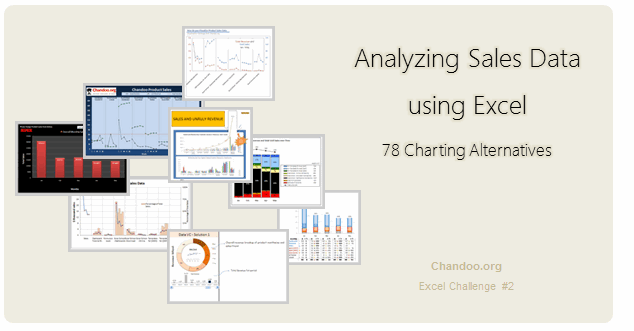 Long time readers of Chandoo.org knew that I like to learn from visualizations in NY Times & redo them using Excel. Today let me present you one such chart. 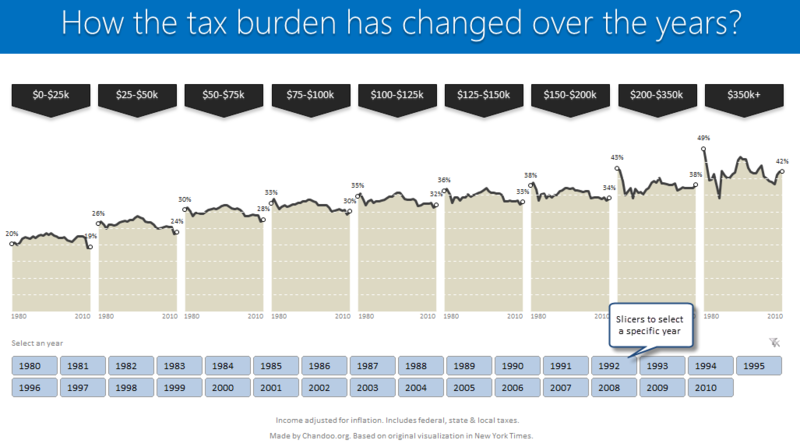 This is based on an interactive visualization prepared by NY Times explaining how the tax burden has changed over years for various income groups. 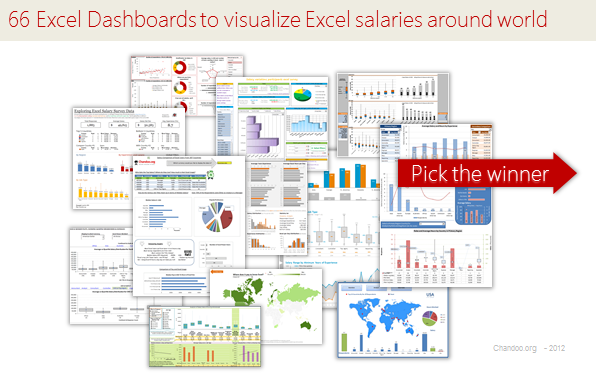 Recently, we published 66 dashboards visualizing Excel salaries around the world. Each of the contestants have put in great effort and hand-crafted these beauties. Now its time we picked a winner. Readers (that is you) pick a winner and runner-up using online voting. Judges (2 of them) will also pick winners. Judges vote carries 20% weight. 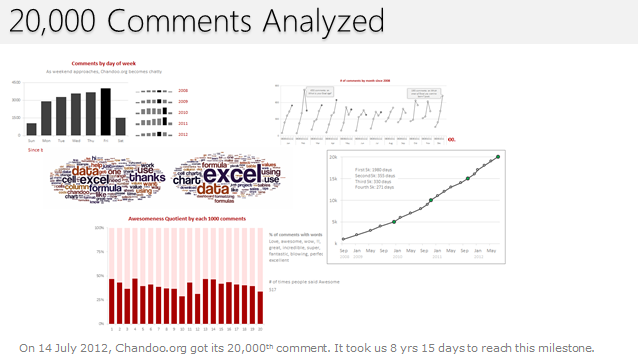 On 14th July, evening 4:51 PM (GMT), Chandoo.org received its 20,000th comment. 20,000! The lucky commenter was Ishav Arora, who chimed, “Like super computers…Excel is a super calculator!!! !” in our recent poll. It took us 8 years & 15 days since the very first comment to get here. And it took just 1 year 7 months & 23 days to add the last 10,000 comments (we had our 10,000th comment on 21st November, 2010). Out of curiosity, I wanted to understand more about these 20,000 comments. So I downloaded our comment database, dumped it in Excel and start analyzing. Welcome back. 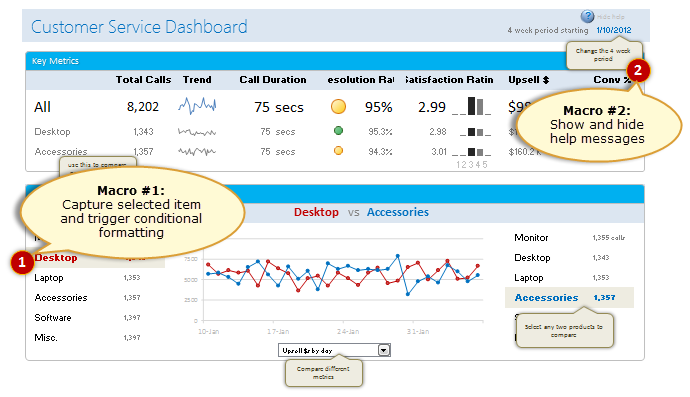 In final part of Making a Customer Service Dashboard using Excel let us learn how to add macros & VBA code that makes our dashboard interactive. As you can see, there are 2 important macros in this dashboard. Today, lets learn how to create small-multiples (or panel charts) to visualize trend of 2 product lines over years in various regions. The inspiration for this chart and article came from my friend, Paresh‘s recent article on his blog. See how you can create a combination of area & line chart to create the small-multiple chart and clone it. You can also download the workbook and play with it to understand this technique better. Dynamic charts are like my favorite food, Mangoes. They tempt, tease and taste awesomely. In this post, we are going to learn how to create a dynamic chart using check boxes and formulas as shown in the animation aside. 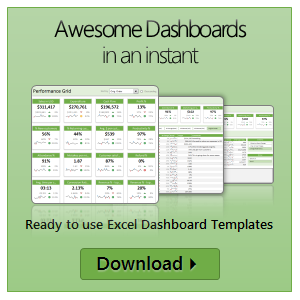 Are you ready for some excel chart cooking? You can also download a FREE Dynamic chart template from the post. So go ahead and make your boss drool.